The text has 75 footnotes. Samuel Tadros of the Hudson Institute has dutifully followed the internal power struggle consuming the Muslim Brotherhood since the fall of Morsi. It is a long read, but he ties the strands together in a compelling narrative. The thrust is that there are two competing wings, an old guard that wants to protect the principle of peacefulness — if only to maintain a longstanding international reputation. 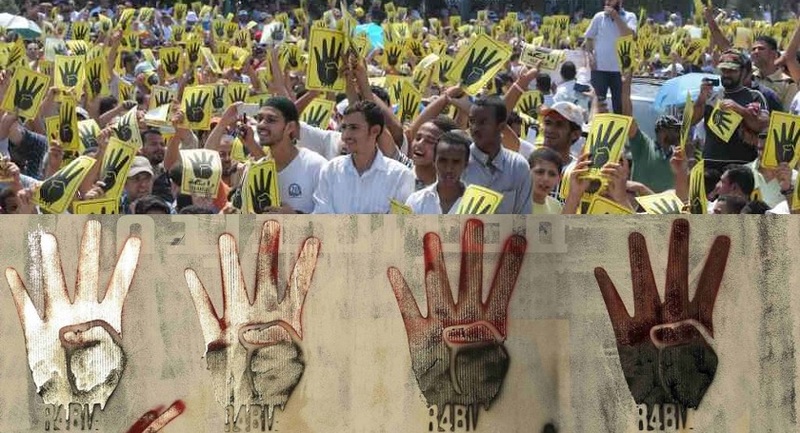 Beneath their leadership are the youth bent on revenge for the sufferings of Rabaa and continued demonstrations. The latter, he writes, have been imbued with a heavy dose of ‘revolutionary Salafism’, pushing conflict with the regime. And with so many leaders imprisoned, it is very difficult to maintain the traditional system of cohesiveness and obedience. The split has not taken place, but it is brewing. At the heart of the Brotherhood crisis sit two competing visions. Neither side can claim a coherent strategy. The old guard believes that the Egyptian regime should be given a chance to implode on its own. In this view, a combination of economic decline, security failure, and growing discontent will lead either to self-destruction, an internal coup, or Western intervention by pressuring for reconciliation.58 To maintain momentum, demonstrations need to continue even if they do not produce immediate results. On the opposite side, the new leadership, and behind it the Brotherhood’s rank and file, believes that only by bleeding the regime can it be brought to its knees. A regional deal is precisely what they fear as it would mean that all their sacrifices would have been in vain and their tormentors would not be punished. Their war with the regime is no longer about Morsi and the coup; in fact, Sisi’s removal would solve nothing for them. Instead, the struggle is an ideological one between Islam and apostasy, between right and wrong, between them and the “Army of Camp David” and its “Zionist masters.” Such a struggle stems from a worldview that allows no compromise. From well informed research, Tadros puts forward speculation that is well fitting within the reputation of the Brotherhood. Perhaps the leadership is ok with this division. The mixing of Islamists had an effect on the speeches. Speakers, in English, portrayed the struggle as one of democracy against a coup while others, in Arabic, cast the struggle in the language of jihad. This was not merely the Brotherhood’s famous two discourses in two languages, but the result of genuine confusion and disorientation. After all, as a Brotherhood member lamented, “our peacefulness is not stronger than bullets.”38 Allowing the special units to conduct these attacks would hurt the regime without committing the whole group to the path of violence. 39 The calculation would prove mistaken as violence spiraled out of control. His shift was in response to the horror of the Revolutionary Punishment’s assassination of a civilian which it accused of cooperating with the regime,65 and a realization that such acts would tie the Brotherhood to violence and end any prospect of the Brotherhood regaining public support. An organization in confusion also fits with Tadros’ thesis. But to what degree is Brotherhood leadership — to the extent it exists — engaging in conscious Machiavellian politics? Obama came to office intending to defeat al Qaeda with a lighter footprint, through drone strikes, partnerships with local allies, and the cultivation of more moderate Islamist groups. He understood the nuances of intra-Islamist politics and seized the opportunity to divide the mainstream of Islamism from al Qaeda and stop the spiral toward a clash of civilizations. Obama’s willingness to work with the Muslim Brotherhood following Mubarak’s fall was a departure from decades of U.S. policy and the strongest signal Obama ever sent that the United States believes in democracy regardless of who wins. By early 2012, Obama’s policies on Islamism were proving successful. Lynch then blames the coup and anti-Brotherhood Gulf propaganda as being the primary catalysts of current Islamist violence. Surely there is a contributing effect. But Brotherhood literature has long imbued adherents with the worldview of ‘a clash of civilizations’ — just not now. And as Tadros’ essay details, even in 2012 the Brotherhood’s primary allies were Salafis, whose strident ideology is now convincing the ideologically vacuous Brotherhood that the priority of pragmatism — and with it the adoption of peacefulness — was a wrongheaded betrayal of the principle of jihad, to which they paid only lip service. Lynch’s analysis is astute, but does he understand the nature of the Brotherhood? Or only of part of it, the part he hopes can be peacefully integrated into the world system providing an escape from instability, autocracy, and the ever present call for the US to re-intervene militarily. Who would not want such an outcome, and the Brotherhood seemed to promise it. Only as time is now telling, as Tadros seems to suggest, that only part of the Brotherhood promised it. Let there be all sympathy for the Brotherhood in their trial. They are under tremendous pressure. It is amazing how their organization is still holding together, and a testament to their belief and commitment. But it is only when a man is tested that his true colors show. And for a very large section of the Brotherhood, they witness that peacefulness was a means to an end. Under pressure, they strike back. Very natural, of course. But also very ugly. Just watch their satellite programming. Have they suffered human rights abuses? Most certainly. Have they been cheated? Of course. At the least they were outmaneuvered. But all their appeals in English lose sympathy when the Arabic is read. But is this their internal decision and strategy, or the flailings of an organization in chaos? Even after reading Tadros, I’m not sure. Even he is cautious between deductions and assertions. Do the talking points meet in a coherent conspiracy-theory whole? As one wing warns of state collapse and a Syria scenario, is the other wing working to make the threat real? You be the judge, but let 75 footnotes guide you along the way.